Fort Canning Hill, originally known as Bukit Larangan (or "Forbidden Hill" in Malay) has been a local landmark in the city since Singapore's earliest recorded history.It has been the exclusive address of many of Singapore's rulers and colonial leaders dating back to the 14th century when it was the site for the palatial resort of former Majapahit kings, then in colonial times became the location for the residence of colonial governors starting with Sir Stamford Raffles. 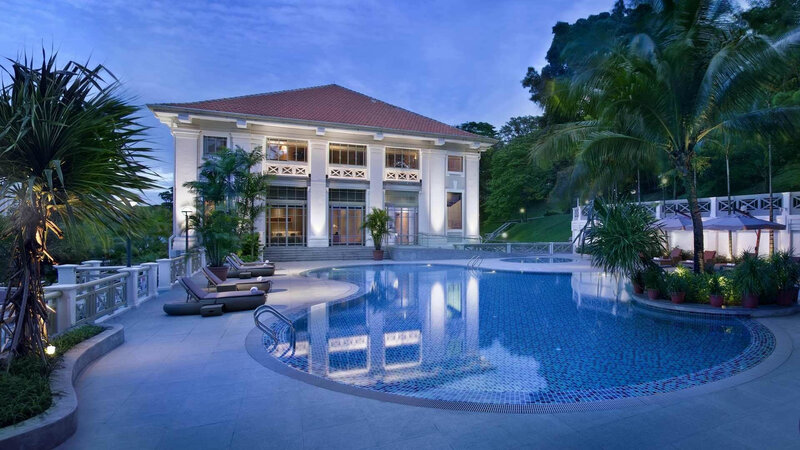 Located at the junction of Canning Rise and Fort Canning Road in Singapore's Central Business District, it is only slightly more than 60 metres high but has a long history intertwined with the city-state – not least due to its location as the highest elevation within walking distance of the civic district.Key historic events have taken place upon this hill, including the establishment of the infant Botanic Gardens and the surrender of Singapore to the Japanese by Lieutenant General Percival. It was recorded as Bukit Larangan prior to the arrival of Stamford Raffles in 1819, which means "Forbidden Hill" in Malay. Raffles was told of how local settlers were wary of ascending the hill as they believed it was the site of palaces built by their ancestral kings. The Keramat Iskandar Shah at the foot of the hill was believed to be the resting place of the last Malay king of the island, and was venerated by Muslims. When some of the vegetation was removed, ruins of ancient brick buildings were revealed, validating these folk legends. 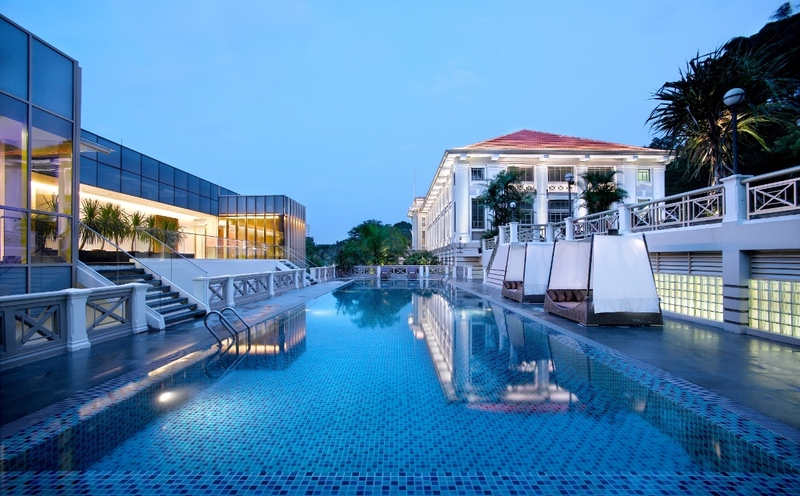 Little could be known from these ruins, however, or that of the hill's ancient history.Contemporary archaeological excavation has, however, built up more evidence of its role, and that of Singapore as a whole. Relics were uncovered on the hill suggesting the existence of a regional trading hub prior to their destruction by invading foreign forces since the 14th century, and the possible site of the hill as the centre of this trading post. Impressed by the historic significance of the hill, and the commanding view it offered over the colony he had established, Raffles built his first residence on the hill. Completed within two weeks, it was a wooden bungalow 100 ft long and 50 ft wide with venetians and an attap roof and verandas at both the front and back.A keen botanist, he also built Singapore's first botanical gardens there in 1822, headed by surgeon Nathaniel Wallich, who had had earlier success in setting up the Botanical Gardens in Calcutta. At least 48 acres of land was staked out, including the Government Gardens on the slopes of the hill, where nutmeg and cloves had been planted since 1819. Fruit trees were also abundant on the hill, remnants of a possible royal garden under the ancient Malayan kings. Unfortunately, rising costs of maintenance and the lack of government support saw the closure of the experimental spice gardens in June 1829 but not before Wallich had produced a new strain of orchid, the Vanda Wallachii. The residence continued as home to the colony's governors, thus subsequently earning the name Government Hill, until late 1859, when increased security concerns led to the hill taking on a military role, with the demolition of the governor's residence and the building of a fort with an arms store, barracks and a hospital. 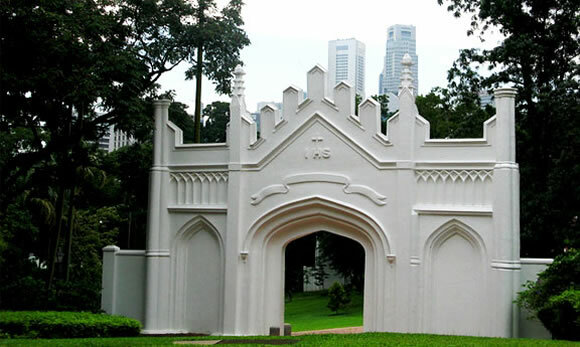 The fort was named Fort Canning after Viscount Charles John Canning, who was then Governor General and the first Viceroy of India. Government Hill was thus named after the fort, and has remained so ever since even after the end of its military role more than a century later.Under the British Army, the fort served as the headquarters of the Singapore Base District until the spread of World War II into the Asia Pacific in 1941. In February 1942, Lieutanant-General Arthur Ernest Percival established his command post of the Malayan Command at the fort in his ill-fated attempts to defend the island from the invading Japanese forces. The Japanese also used the fort for its military until the end of the Occupation in 1945, whereby the British army resumed control. As the island moved towards self-determination, the British handed over control of the fort to the Singaporean military in 1963, and was home to the headquarters of the 4th Malaysain Infantry Brigade until December 1966 when it was in turn handed over to the Singapore Armed Forces. The SAF proceeded to build the Singapore Command and Staff College on the fort, which officially opened on 13 February 1970. The hill was renamed Fort Canning Park with the planting of a fruit tree by the then-Prime Minister Lee Kuan Yew on 1 November 1981.Now a park overlooking Orchard Road in the heart of the Civic and Cultural District of Singapore, Fort Canning offers a variety of receational activities, historical, educational, entertainment and cultural experiences. The park also serves as an important green lung for Singapore's downtown city area. The unique blend of historical relics, lush greenery and expansive lawns has made Fort Canning a hub of cultural and artistic activity.It has been a venue of choice for staging a myriad of outdoor events and activities like theatre carnivals, art festivals, starlight cinemas and Ballet Under the Stars performances, Shakespeare in the Park, WOMAD, Singapore's largest music festival, has been a regular feature of the park's calendar of events since 1998. The Fort Canning Tunnel passes directly under the hill.